It's not easy to do this, and you have to decide it's worth it. In my recent road trip, I learned some lessons you may find of use. You need two sets of ice packs, and you swap them once a day to freeze overnight in hotel or apartment freezer. Avoid mini-fridges of hotel rooms. Here's more than you wanted to know! Just cold drinks or perishable food? It's a lot easier if all you want is cold drinks. If you want perishable food you need a "cold chain" -- a cooler that will stay down under 40 degrees (5 centigrade) at all times. 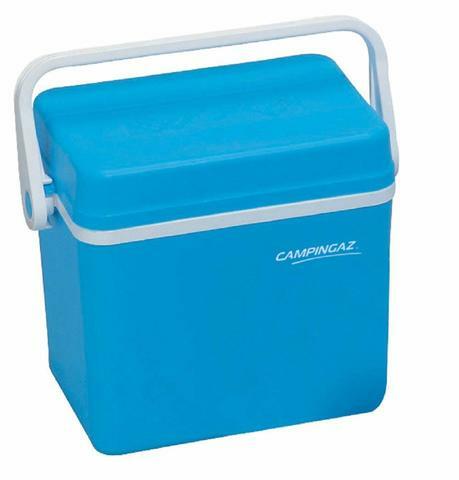 In theory, a cooler that still has solid ice meets that test, but in reality if you open it a lot or it sits in the sun, it may be hotter in some places than others. If all you are doing is drinks, you don't care if the cooler gets too warm at certain times, or melts entirely overnight. You may also decide to have cold food only for the rest of the day, expecting to eat it or get it to a fridge by nightfall. Hard-side cooler or foldable one? There are lots of foldable coolers out there for reasonable prices. I went with a hard-side because they are stronger and they are better insulated. Mine (pictured) was so well sealed I could not open it after driving down a hill due to air pressure and I had to make a tiny hole in the seal! You can pack a hard-side in a duffel bag as airline luggage, and even put things that need protecting in it. I have not seen a low cost cooler that I would trust as checked luggage on its own. Soft-sides can have an easier carry strap, and they often come with external pouches to put things that don't need to be cool, like cutlery and dry snacks. For short trips stores in the USA commonly sell styrofoam coolers for just a few dollars. These are fragile and not for a long trip, and they are much harder to carry to your room. I have also found that in some countries they are far from easy to find. If you go for a hard-side, you can elect for coolers with a peltier cooling element that plugs into your car power jack, and sometimes also into household power. It is important to understand that just doing this is not enough to keep food or drinks cool. Rather, electric coolers make your ice last longer. That is valuable, but I have yet to really try one out. They are not that expensive, and only add a bit of weight, so perhaps they are valuable, but there will also be long periods when they are not plugged in, so I don't know how much ice you save. Of course, the less ice you need, the more space you get in your cooler. There are some portable refrigerators that use compressors and can really cool on their own. They are pricey and you must be sure you will always have power. A car battery can get drained trying to run one of these. Pack it or buy it at the destination? If you don't have elite status on all the airlines you will fly, it may make sense to buy the cooler at your destination, and even to discard it (or give it to somebody else when you return your rental car) when done. That's because many airlines charge $30 for an extra bag, and your cooler will probably require an extra bag and need not cost much more than that. If you do want to pack it, it can help protect other stuff you pack. If you want to buy it, one new option, depending on where you are going, is to buy it from Amazon and have them deliver to one of their "pickup depot" locations. In my case, there was one at a gas station next to the airport. I pre-ordered and picked it up as we drove away from the airport. Otherwise, you need to do a bit of shopping. Coolers are found in many stores, including large grocery stores, but you don't want to hunt around -- best to confirm in advance that you have a store to get it at. Amazon tends to be cheaper. Blue ice packs or re-used plastic water bottles, or bought ice? Water bottles are free. You actually will want a lot of ice, and you may need 2 complete sets. Blue packs can be a lot of room and weight in your bag if going in airline luggage. Blue packs actually have some empty space so they take a little more volume per kg of ice. You can usually find rectangular water bottles which also pack fairly well. They are pre-set to handle the expansion of freezing ice. When you put water bottles in the freezer, you must either have them be upright with the lid loose, or more simply you just squeeze them before closing the lid to leave some room. Everybody understands what they are, and that they go in the freezer. I've had hotels, in spite of explanation, put water bottles in the fridge or on a bed of ice. The pack together almost perfectly, in your cooler or in the freezer. The remaining (and backup) choice is bag ice, from stores and gas stations or hotel ice machines. The problem with this is that it always leaks. You may want to try to find a very heavy duty waterproof thick bag to put this in. It's a good idea, because the day will come when your ice packs don't freeze overnight and you need a quick solution, and buying a bag of ice at the gas station is the easiest thing. Bag ice has tons of surface area to volume, so it melts fast and cools well. You will need two "shifts" of ice packs. In the morning, you will load your frozen "A" ice into the cooler. You need it to last about 27 hours. When you get to your hotel/freezer, you will then freeze the "B" ice overnight, and then in the morning replace the mostly melted A ice with the B ice. The next night, re-freeze the A ice. This strategy gives you the most room in your cooler. An alternate "always in" strategy is, in the morning, to put the new B ice in the cooler along with the half-melted A ice. Together, they will last longer. The B ice will be less melted this way when you take the A ice out to the freezer. As such, you can get by with less total ice, but it takes more room because it's all in the cooler. In general, you should keep all ice bottles/packs that still have some ice in them in the cooler if they fit. Remove the most melted when you want to make room. Why waste the cold? When you stay in a hotel with no fridge for 2 or more nights, just swap your ice once a day. Some hotels will have a bellhop send up the frozen ice and swap for your melted ones. Some may lose your bottles. Generally you ask your hotel to freeze your older icepacks in their freezer. Make sure they know you want the freezer -- look up the word in the local language for freezer. Collect them in the morning. If you have a room or AirBNB with a mini-fridge, be careful. Many small fridges do not have the capacity to solidly freeze fully melted ice packs. Sometimes they can barely refreeze half-melted ones. You won't know that until the morning! Unless you are sure, give at least one set of packs to the hotel to put in their big freezer. If you have a room with a full sized fridge with a real freezer, you are probably OK. If you have a fridge or freezer in the room, move your drinks and food into it, and put as much of your ice in it's freezer as you can. If you give your B ice to the hotel, you can still put the A ice into the mini-freezer since the food now has the fridge to keep it safe. You may end up with A and B fully frozen, which is great if you are following the "always in" strategy. However, this is more work, so you don't absolutely have to do it, but do it every so often just to clean the inside of the cooler. In all cases, if your ice fails to freeze, or if, as in my case, a hotel loses your ice, fall back on the use of a bag of ice cubes from the hotel or a store. Hotels have all gotten rid of ice machines but they will bring you a bucket -- or two if you ask nicely. I suggest something in the 25l range, depending on how much you want to have in the way of cold drinks and food, and how large your ice shifts are. If you are keeping all ice in the cooler at all times, you need a bit more room. This depends on the size of your cooler, how often you will open it, how often you will put in warm drinks, how many people you have, and of most of all how hot it is. In hot places, it can get really hot inside a car. You may want to put some foil or a cover over your cooler if it will get in the sun. I found 3L of ice generally worked with a smaller cooler, but not quite in the hottest climates. 2L+2L on the always in can also work. Some basic physics. The heat to change 1L of water by one degree centigrade is one Calorie (with a capital letter -- it's 1000 calories with a small c.) But melting ice takes 80 Calories, which is why ice is so good for cooling. So it takes 15 Calories to chill your 1L drink from 20 degree room temperature to 5 degree cold drink, and so a liter of ice can do that 5 times. Once your last bit of ice has melted, you still have 20 Calories of "cooling" in it but you won't get all of them. Your cooler will be losing cold (absorbing heat) all day. How fast depends on how good it is, and how hot it is outside, and how often you open it. Ideally, your drinks will start the day cold, out of your hotel fridge or your other shift of ice. However, you can still put in a decent number of warm drinks and chill them down. If your ice has lots of surface area (thin ice packs or cubes) it can transfer heat in faster. That means it can cool things faster, but won't last as long. But cooling faster is important if you will be opening the lid or exposing the cooler to sun or heat. Bags of ice cubes are fastest. Once the last ice is gone though, your cold chain will quickly be lost. Ice will get condensation on it, you may get a little water in your cooler, or in your car where you put the mostly melted A ice on strategy #1. If you go with bag ice, consider finding a rack or shelf you can put in the cooler so the leaked water does not get on your food. Leaked cooler ice is not always food safe. In theory, if you use bottles with clean water you can drink the cold water as it melts or after it melts. In reality, timing for after it melts is hard, so you get a little water and must wait hours for more. And while I can't explain why, I have never found this icepack water to taste clean, even if made from bottled water. If you drink diet drinks, get packs of powered or liquid "water enhancer" to flavour water. These are available in many grocery stores around the world, and are compact enough to bring in luggage. You get a wide variety of diet flavours (mostly fruit) and you will save a fortune compared to trying to buy the drinks. Diet drinks are rare outside the USA and a few countries. It's still good to buy food that doesn't need refrigeration. In many countries, eggs are sold warm and can keep for a long time. Put a little butter in the cooler to fry them in. There are many types of sausage that don't need cooling as well. we just get a styrofoam chest when we arrive. We just make a stop at a local grocery store when we arrive. We also get a pack of water bottles, yogurt, fruit etc. as well. It's fun to see the local grocery store and whatever local foods they serve. We bring sturd zip lock bags to handle our ice, and normally just use the ice from the hotel. I have bought them before, but aside from the fact that they are so fragile, it's also true that there are parts of the world where they are not common. They are common in the USA at typical grocery stores and stores like Target/etc. I do not see them often in many European countries. I also found it nice to bring the cooler into the hotel room (easy with a solid cooler or foldable, not easy with a foam one) and have cold drinks and snacks in the room. I've done the ziplock thing too, but found they leak after a while. Your approach is good for trips of a week, but I don't think it's right for longer trips. It is also getting harder and harder to get ice from hotels. They are eliminating their ice machines. On the plus side, getting a bag of ice from them is just one interaction, while giving them bottles for the freezer is two, and it adds up.